Flowers in her hair — a fashion trend this year. They add to the look of freshness and romance. It can be accessories, decorated with delicate orchids, or hoops in ethnic style, like the Ukrainian wreaths. Prepare the basis for the bezel with flowers. The end of the satin ribbon 2 cm wide stick to one side of the rim and tape it to a surface, place the coils slightly overlap. Excess material cut and glue the edge. From felt to match the ribbon, which was wrapped rim cut 2 piece of size 1x3 cm Wrap them around the edges of the wrap and secure with hot glue. Make roses. Use the material in two contrasting colors, for example red and white or yellow and blue, look beautiful headbands with flowers in one color, made of strips of dark and light shades. Wide strip, cut into pieces 30 cm each (total received 10 items of each color). The tape edge fold at an angle of 45 degrees and wrap it. Secure the first petal of the Bud a couple of stitches at the bottom. Fold the ribbon again and wrap it around the middle of it. Secure the petal at the bottom of the Bud two or three stitches. Continue to do a rose this way until the end of the ribbon. Slightly spread the middle of the flower. The stamens are ready to apply a DAB of glue and insert them into the center of the Bud. Prepared roses glue with hot glue to the rim or firmly sew the thread. Place them on their own. Between flowers glue artificial leaves. Let the glue dry. Prepare parts for flowers. Ribbons cut into squares. Sear their edges so they don't crumble in the process. Square fold in half diagonally and then in half again. Connect the slices and sear them lighter. While the edges are still hot, hold them with your fingers. So get a petal for a flower-kanzashi. Similarly make the remaining petals on flowers and leaves. Connect a few items, putting them in flower. Stitch in the middle. In the center apply a drop of hot glue and attach polybutene. Out of felt cut a circle and glue it to the flower. 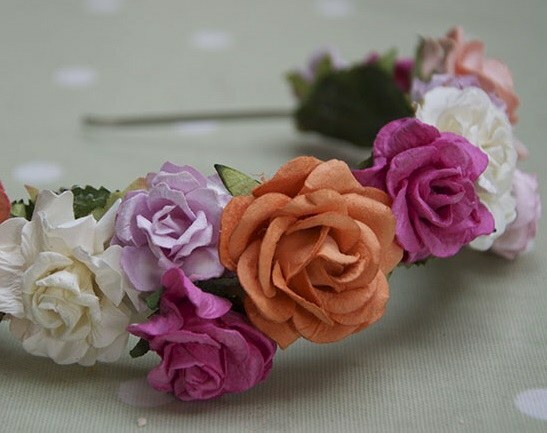 Then put a DAB of hot glue on a plastic headband and glue the prepared flower. In the same way, attach all the other elements.